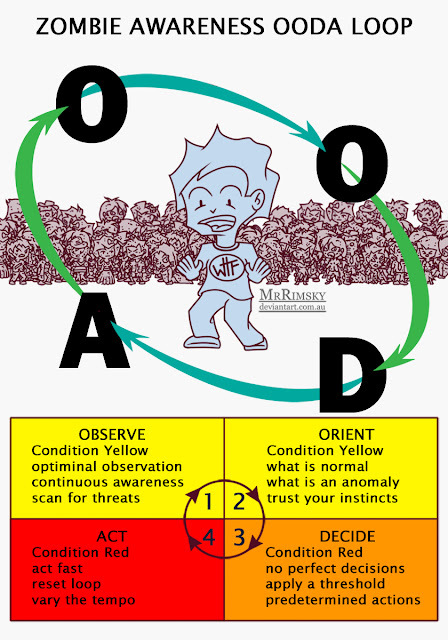 When too much OODA is not enough. In this chart I have added a few more details to the OODA steps and used Cooper's colour code to show your possible state of awareness in each stage. The United States Marine Corp use some of these principles in their combat profiling course. Marines are trained to look for anomalies that stand out against what should be a normal situation. Like you may suspect a person in the local market is being up to no good because they are always looking over there shoulder. Naturally it is easier to spot zombies. But one odd thing or bit of strange behaviour may not mean anything serious is going to happen. So there is a threshold set. For example three odd things would be considered enough to trigger making a decision. That decision is probably a based on series of predetermined acts, for zombies, run, hide or fight would be a good set. In the first instance you would run but if this was not possible, hiding would be next. Fighting would be the last resort. The colour code is a guide. Your state of awareness will vary depending on the situation. In a low stress situation you may just stay in condition Yellow as you keep cycling through the loop, avoiding zombies before they can get to you. But if things get desperate and you find yourself into a fight to the death with a zombie, you will move up to condition Red and as stay there. You will keep cycling through the loop as you deal with each attack the zombie throws at you. In the worst case scenario you go to condition Black and you start to falter. The zombies then get to eat your brains.